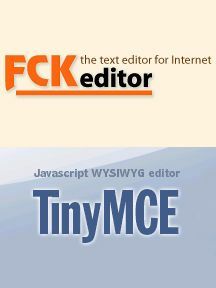 FCKEditor and TinyMCE find themselves In the battle to be the favourite web-based WYSIWYG text editors. Before implementing either editor into your web app it's defintely important to consider the pro's and cons of each. FCKEditor is distributed under the GPL, LGPL and MPL open source licenses avoid incompatibility with other open source licenses. TinyMCE has a license associated with each downloaded package - look for license.txt. The current release is under the LGPL. FCKEditor offers limited subscription-based support contracts but doesn't cover bugs or new features. TinyMCE offers no public support except through their forums. Both FCKEditor and TinyMCE have active community bases for support. It comes down to personal preference as to which community is preffered. Here's where TinyMCE gets its name and moves well beyond the bloat of FCKEditor. The size depends on how many plugins TinyMCE is configured to use but most of the time only a relatively simple formating experience is needed so the code size will optimal. When there are lot of plugins needed for TinyMCE a PHP compressor can be called to group all of the plugins together and have them be served as sweet as can be. This prevents a massive number of attempted simultaneous requests which give great page loading potential. The user experiences are very similar but TinyMCE inches ahead by being the later starter and incorporating more modern styling techniques. The smooth modal dialogs are the most notable difference. Both FCKEditor and TinyMCE offer a variety of different engines (server-side and client-side) that can be used for spell checking. FCKEditor stands out with an option to allow FireFox spell checking which is a quick and simple method for those looking not to get too technical. TinyMCE stands out with a nice inline spell checking tool that puts the non-modal dialog of FCKEditor to shame. TinyMCE also makes it relatively easy to implement in other languges and can be chosen at the writer's discresion. Both products are fantastic and have shaped the web in amazing ways. TinyMCE is the late starter but it is stella product that has been developed with the power of 20/20 hindsight. When looking to integrate either package make sure to do a lot of testing and go through every toolbar option to make sure it works as you would hope it would before integrating it into your app as it can take one small thing to make you jump ship to a different editor.